The species is widely distributed as far north as central Scotland but it is absent or very scattered in many parts of the country. It is widespread in western and central Europe. A species collected from a wide variety of habitats including woodlands, grasslands, raised bogs, coastal cliffs, shingle beaches and wastelands and other disturbed habitats such as quarries. In these varied habitats, it is commonly found in the drier parts, occasionally seen active on the surface but more commonly within litter. In northern Britain the species seems to need sunny conditions (J. Newton, pers. comm.). 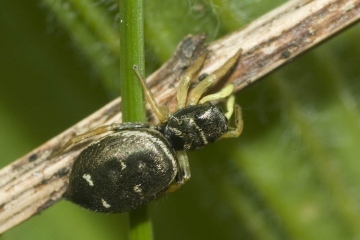 During a resting period, this spider may be found in a silken cell placed under stones or in litter. Adults of both sexes are found mainly in May, June and July, females persisting occasionally into the autumn. Local. In northern Britain it is more common along the coast (J. Newton, pers. comm. ).